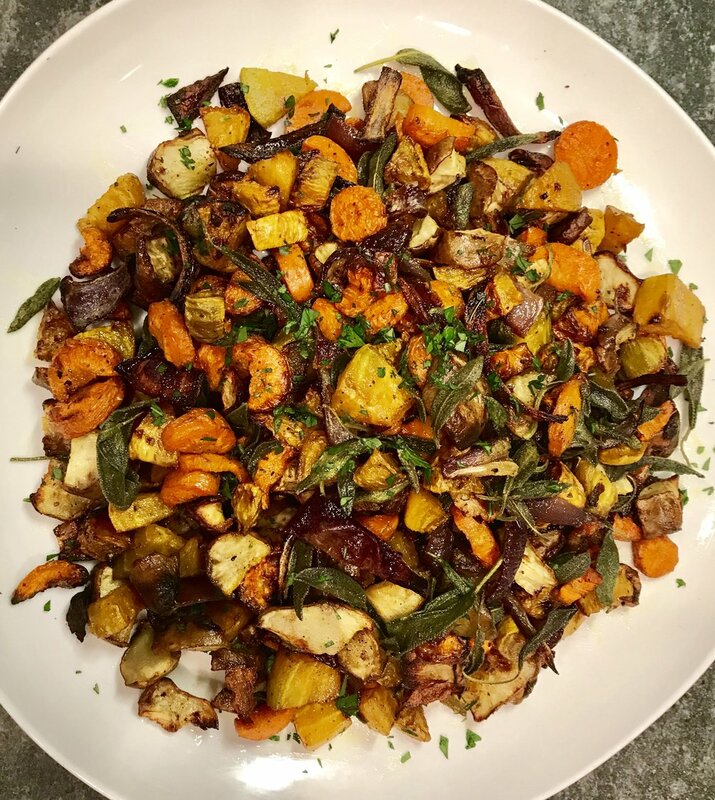 A great way to use Sumac is with roasted vegetables. In this yummy side dish it adds a bold tart flavor that tastes great with the natural sweetness of the roasted cauliflower! Combine cauliflower, oil, sumac, garlic, lemon zest, salt and pepper. Toss well and place onto baking sheet. Roast until lightly browned, around 20-30 minutes. Transfer cauliflower to a bowl, add parsley and drizzle with lemon juice and toss. Season with additional salt and pepper if needed. Finally, sprinkle a drop more sumac on top, serve and enjoy! During the fall and winter months, roasted veggies are a deliciously healthy way to feed our cravings for warm, comforting and filling foods. This combination is made up of vegetables that are in season so they’re exceptionally flavorful and packed with fiber, antioxidants, vitamins and minerals. This also makes a beautiful and impressive side dish for entertaining that’s really easy to make! Toss vegetables in oil and season generously with salt and pepper. Roast veggies for about 20 minutes, check and then toss on the baking sheet and cook for another 5-10 minutes or until veggies are almost tender and just starting to brown. Sprinkle veggies with thyme and rosemary combination and sage leaves and toss everything again on the baking sheet. Roast for about 10 more minutes or so until sage is crisp, the veggies are tender and perfectly browned. This Delicata squash if one of my favorite side dishes to prepare! It’s so simple, so pretty and absolutely delicious! Roasting brings out its delicate sweetness and gives the squash a rich and creamy texture. It also saves you time in the kitchen because you don’t need to peel the skin as you do with most other kinds of squash. The skin is not only edible it’s packed with tons of fiber, vitamins and minerals. Clean squash by running under water and scrubbing away any dirt with you hands. Cut and remove seeds and arrange squash in a single layer on baking sheet. 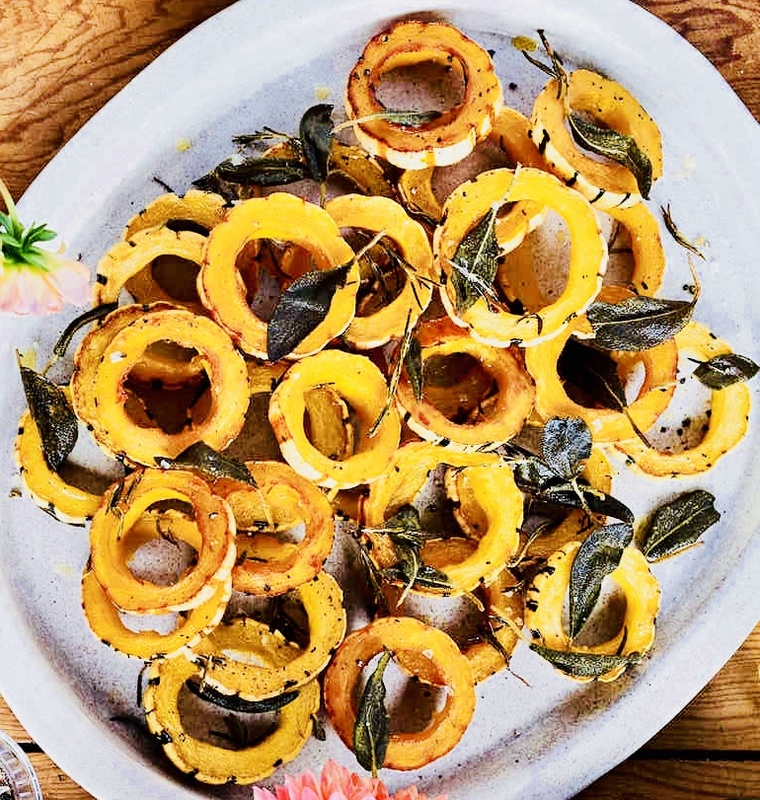 Coat both sides of squash with olive oil and sprinkle with herbs. Season with salt and pepper. Roast until squashes are starting to brown and caramelize, about 20 minutes. Using a spatula flip squashes and continue to roast for about 15 minutes or until tender and golden brown. This open-faced toasted sandwich is the perfect breakfast! Ezekiel bread toasted to golden perfection, slathered with creamy mashed avocado, and topped with paper-thin radish slices, dill and microgreens. It’s all incredibly easy to put together and the combination is amazing! Halve the avocado and scoop the flesh into a small bowl. Using a fork, smash the avocado into a creamy mixture. Spread each piece of toast with the smashed avocado, layer the radish slices, sprinkle the dill on top and add the microgreens. Squeeze lemon on top and sprinkle with salt and pepper. These super yummy easy-to-make avocado cups served with slices of jicama are the perfect healthy and delicious appetizer or snack. Scoop out the pulp from the avocados in place in a medium bowl. Slightly mash with a fork or a potato masher leaving some larger chunks. Add the rest of the ingredients to the bowl and stir until they’re well mixed. Satisfy that craving for something crispy with homemade, healthy, delicious veggie chips! My family couldn’t eat these fast enough! I used golden beets, purple potatoes, sweet potatoes and celery root. 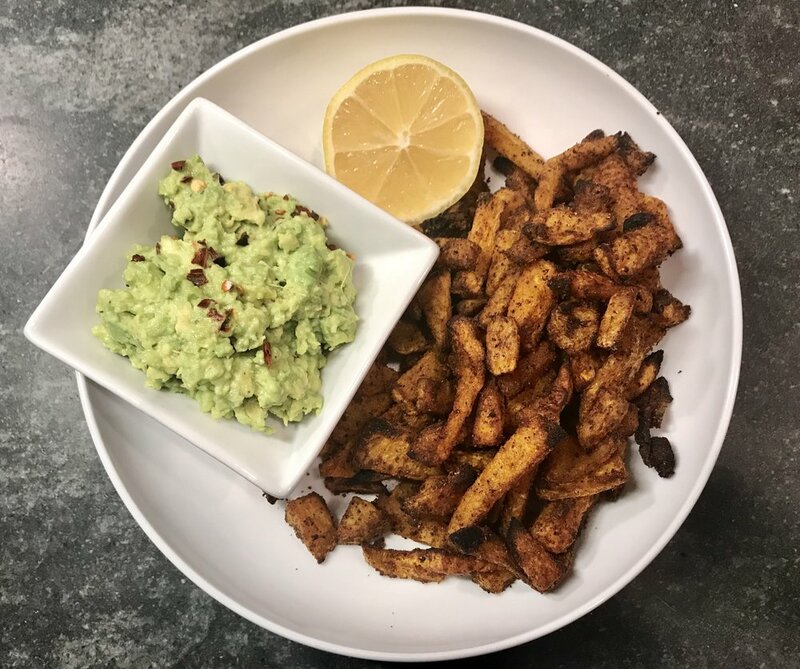 With a little bit of salt and good quality oil like extra virgin olive oil or coconut oil you can turn any firm, flavorful tuber or root veggie into a delicious salty chip that your family won’t be able to resist! Peel celery root and beets. Wash the potatoes but you can leave the skin on. Slice all the veggies as thinly as possible (I used a mandoline) about 1/16 inch thick. Place a wire cooling rack over a rimmed baking sheet; lightly mist rack with olive oil or coconut oil cooking spray. Lay vegetable slices on rack as close together as possible without overlapping. Spray lightly with olive oil and season with salt. Bake for 10 minutes and then flip slices and bake for another 10 minutes. 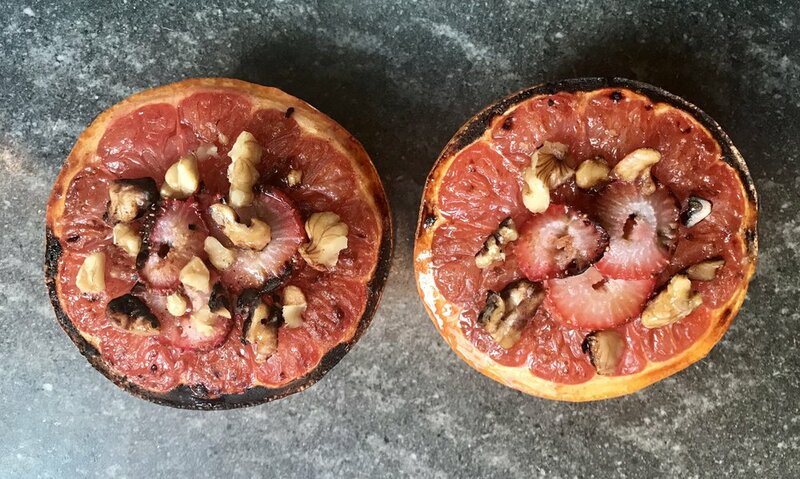 Continue baking slices in 3-5 minute intervals, removing slices that are turning golden and beginning to crisp (vegetables will crisp further as they cool). Continue until all slices are done. Sprinkle with parsley (optional) and enjoy! This is one of my favorite sautéed vegetable medleys to make as a side dish to any entrée. It’s delicious, packed with vitamins, minerals, antioxidants and takes no time to make. You can easily replace a vegetable here and there, too, if you prefer another one or don’t happen to have one of these on hand. Heat 1 tablespoon coconut oil, ghee or grass-fed butter in a large skillet over medium-high heat. Cook and stir asparagus until just tender about 3 minutes. Season with salt and pepper. Add mushrooms and sauté for another 3-4 minutes. Add in the Coconut Aminos and stir. Add spinach and arugula to skillet and sauté until wilted and other vegetables are starting to turn a golden brown, about 5-7 more minutes. Taste and if needed add more salt and pepper to taste. Remove from skillet and top with Eden Shake Sesame and Sea Vegetable Seasoning. My daughter and I took a classic recipe for pumpkin bread and substituted some of the ingredients to make a "healthier version" by using a mix of almond and coconut flour instead of white flour and sweetened it naturally using maple syrup and honey instead of regular sugar. We also added our "signature topping" using crushed chopped walnuts and pecans. It came out super moist, fluffy and delicious! You can store it in the refrigerator for about a week, or slice and freeze and then defrost individual slices, by either letting them rest at room temperature or warm in the toaster. Pour batter into a greased 9 x 5 inch loaf pan. Combine topping ingredients in a separate bowl until it reaches a crumble consistency. Top the loaf with the crumble topping and bake for 50-55 minutes. Any way you “slice” it kids will love these apple and nut butter slices! Not only are they a healthy, fiber-packed after school snack or dessert but I love that kids can make it themselves in just a few minutes! As for the toppings, the sky’s the limit! Play around and see what you like and add any other toppings that you think will be delicious! Spread almond or other nut/seed butter on top of apple.